Law school officials announced a series of major adjustments to the law school’s Legal Research and Writing Program late last month – the first changes to the school’s core curriculum “in more than a generation,” administrators said. Law students will take on a more rigorous writing curriculum this fall. Law school officials announced a series of major adjustments to the law school’s Legal Research and Writing Program late last month – the first changes to the school’s core curriculum “in more than a generation,” administrators said. The revisions include a switch from an adjunct to a full-time staff, the addition of a new course focused on lawyer-client relationships and an increased credit-hour requirement. 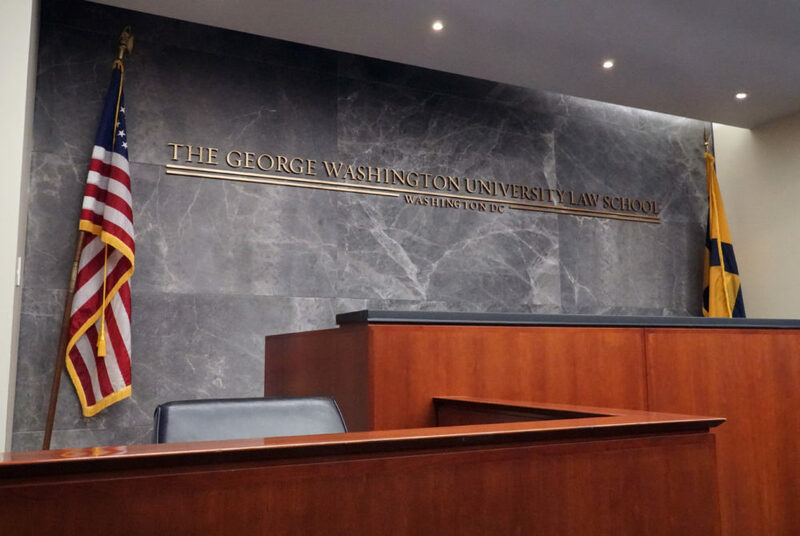 “These changes, which position GW Law as a curricular leader, will augment our already-strong program, add a professional development component and make our students practice-ready,” Dean Blake Morant said in a law school release last week. Starting in the fall, the program will account for six credits instead of four “at a time when most U.S. law schools are offering four or five credits.” The new writing course included in the updated curriculum will focus on administrative law and regulatory interpretation, the release states. Morant said the new curriculum changes offer students more time to hone their skills in areas like client interactions. “No other law school in the area offers this innovation, and it remains rather rare in the legal academy at large,” Morant said in the release. Law school officials said the changes will make it easier for students to gain hands-on writing and research skills that can be directly applied to their careers. Christy DeSanctis, a professor of legal research and writing and the director of the program, said Morant appointed a task force more than two years ago to assess the writing curriculum, compare it to peer schools and evaluate feedback from students and alumni. After more than a year, the 14-person committee proposed a series of adjustments that aimed to “produce more self-directed, self-sufficient, ‘practice-ready’ lawyers,” DeSanctis said in an email. “The research and writing curricular changes – those are skills that virtually every legal employer lists as first most important for junior attorneys,” DeSanctis said. She said the new writing components of the first-year course will focus more on profession-specific writing and relationships between attorneys and their clients. She said the writing projects in the program will be “more numerous but much shorter,” and officials hope the expanded curriculum mirrors what lawyers do every day. “We do not see this change as an intensity move; rather, the goal is to better contextualize the writing that one does as a lawyer with the role of a lawyer and the relationship between the lawyer and client,” she said. She added that the revisions are a “tremendous advance” for the program and put the law school “ahead of the curve.” A “significant” number of competitor law schools have changed their first-year curricula over the past 10 years to include courses focused on legislation regulation or statutory law interpretation, while a “few” universities have implemented five-credit programs, DeSanctis said. Other law institutions ranked similarly to GW, like Boston University and the University of California Irvine, have employed full-time staff to oversee their writing programs and upped their curricula to six credit hours over the past five years. The law schools at Emory and Cornell universities both maintain four-credit legal research and writing programs that are taught by full-time staff. D.C.-area law schools, like American and Georgetown universities, both assign four credits to their first-year legal writing courses. Georgetown’s legal writing program consists of only full-time faculty, while American’s employs a mix of full-time and adjunct faculty, according to their respective website. Teresa Godwin Phelps, a professor of law and the director of the Legal Rhetoric Program at American University’s Washington College of Law, said that while hiring all full-time faculty may have a larger price tag, limiting teaching positions to full-time faculty helps foster one-on-one relationships with students. Robert Volk, an associate professor of legal writing and the director of the Legal Writing and Appellate Advocacy Program at the Boston University School of Law, said making his program’s first-year course worth six credits allowed him to incorporate more training activities, like drafting law briefs, into the class. He added that having full-time faculty in the program grants students the most access to professors.